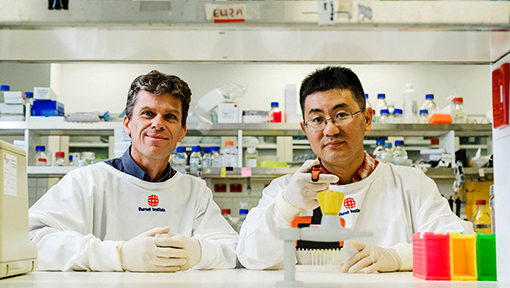 Burnet Institute researchers have used novel approaches to demonstrate the potential for developing a highly effective malaria vaccine to reach goals set by the World Health Organization (WHO). Uses modelling to demonstrate how particular combinations of antigens could form the basis for a world-first effective malaria vaccine. Led by Burnet’s Head of Malaria Research, Professor James Beeson, and senior researcher Dr Linda Reiling, the study identified key antigens produced by malaria infection that the immune response targets to clear the infection and prevent malaria disease. “We studied how immune responses might protect against malaria in children in Papua New Guinea who developed natural immunity to malaria,” Professor Beeson said. Professor Beeson said the researchers identified a small number of antigens that look promising for vaccine development, including some that have not previously attracted much attention. A key innovation was the team’s ability to quantify how antibodies produced by the immune system recruit proteins in the blood (known as complement proteins) to attach to specific targets on malaria to block infection. “Then, rather than focus on one antigen at a time, we asked what if we were to target multiple malaria proteins, which proteins should we target, and in what combinations?” Dr Reiling said. Image: Professor James Beeson and study co-author Dr Gaoqian Feng. “So we used mathematical modelling to look at every possible combination, more than 60,000, and found that some combinations of three antigens predicted 90 percent or higher protection against malaria. Vaccine development is a priority for the elimination of malaria, which kills around 500,000 people globally each year, mainly children. Professor Beeson, however, believes this latest research is an important step towards achieving that threshold. “We can see in this study that kids with the right type of response targeting the right antigens have a high level of protection, and that tells us it must be achievable by vaccination,” he said. “Now we have to refine the selection of antigens to include in a vaccine, and determine the best vaccine approach to generate high levels of immunity. Find out more about Burnet’s projects to eliminate malaria.